Go on, build us one. Please? Everyone - yes everyone - would secretly love to own a Daft Punk helmet, but would you be prepared to devote a large chunk of your life to building one? Harrison Krix - a self-proclaimed "27-year-old dork working in graphic design and living in Atlanta" - was up for the challenge, and after "17 months and countless hours," his unique hi-tech headgear is finally complete. 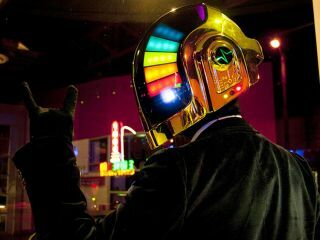 The helmet is a replica of the one worn by the Punk's Guy-Manuel de Homem-Christo, and you can see how it was made, in no less than 749 steps, in the video above. More details are available on Harrison's blog. Oh, and before you ask, no he's not going to build you one. "THIS PROJECT WAS A ONE-OFF. I AM NOT TAKING ORDERS FOR DUPLICATES," says Harrison, and with extreme capitalisation like that, you know he really means it.